In 1-quart saucepan, melt butter over low heat. Add garlic; cook and stir about 20 seconds. Add lime peel, chile, salt and lime juice; mix well. Set aside. In 4-quart saucepan, place steamer basket. Add 1 cup water; heat to boiling. Add cut-up vegetables to basket; cover and cook 4 to 5 minutes or until crisp-tender. To serve, place vegetables in serving bowl. Add butter mixture; toss gently to coat. 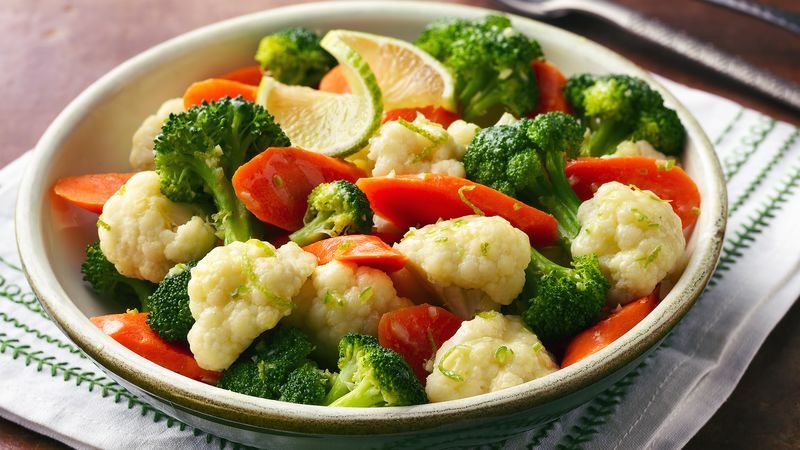 Steaming is a healthy, easy way to cook fresh vegetables. The technique requires no added fat, and vitamins remain in the vegetables instead of leaching into the water, as can happen with boiling.